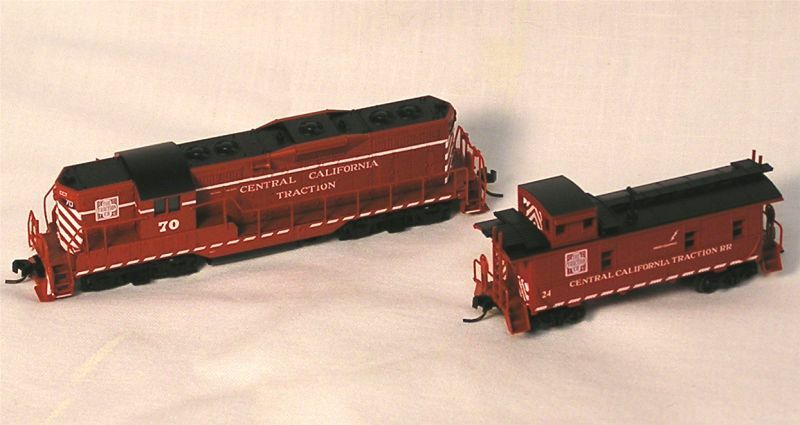 Dear N Scale Modelers: A few months ago we told all of you about a Special Run of California Traction Caboose and GP9 coming from Atlas. We just received pictures of the sample. Here it is. Incorporated on August 7, 1905, the Central California Traction Company was originally conceived as a second streetcar line for the citizens of Stockton as an alternative to the Stockton Electric Railroad. September 1, 1907 saw the beginning of electric passenger train service between Stockton and Lodi, in direct competition with Southern Pacific Railroad. By August 1910, the line had reached Sacramento and passenger trains began through service. Almost immediately came freight service as well. CCT's freight operations carried merchandise, livestock and produce (primarily grapes, strawberries and sugar beets). At its Peak, CCT was operating 36 passenger trains a day, over and above its freight operations. Because of CCT's interurban style of operations, CCT used overhead wires in the cities of Stockton, Lodi and Sacramento, but power between the cities was fed by a covered third rail that was energized at 1200 volts DC, CCT was one of the first railroads to use the high tension DC power in the United States. Power in the cities was still at 600 volts by catenary. CCT underwent a management change 1928 when CCT's owning family tried to sell the company to the Southern Pacific. What followed was a struggle for control between the WP, ATSF, and SP Railroads. Ultimately in 1936, the ICC decided that the three railroads would share the CCT. While the struggle for control raged, CCT fell to the economic climate of the times and on February 4, 1933, CCT's last interurban passenger train made its final run. CCT's freight operations continued under electricity, but demands on power created service problems and in 1946 made the switch from electricity to diesel with the arrival of a pair of GE 44-tonners. On December 24, 1947, the CCT dropped their pantographs for the last time... the CCT was dieselized. Currently, the Central California Traction Company (CCT as assigned by the American Association of Railroads - AAR) Operates over two segments of track: 15 miles of track from Stockton to Lodi, and The Port of Stockton Trackage. Service between Stockton and Sacramento via Lodi was discontinued in August of 1998. CCT runs three operations. One operation works out of the former CCT shops on Cherokee Road in Stockton, using CCT #44, a chop-nose former Alameda Belt Line/former ATSF GP7u. and a recently re-built and re-painted CCT 1790 (GP18) This crew will run five days a week between Stockton and Lodi. New customers have turned this job into a 5-day a week operation. The second and third crews work out at the Port of Stockton, where CCT also has its main offices. The crew there runs 6 days a week and uses 4 ex Southern Pacific SW1500's. All 4 have been re-painted into a new version of the red and white CCT paint. CCT also now owns Harbor Belt Lines 102. This unit will become CCT 700 when it is re-painted in late 2007. If you would like to find out more information on California Traction Railroad please visit the link to this website.